Issey Miyake presents annual limited editions of the fragrances L'Eau d`Issey and L`Eau d`Issey Pour Homme. Summer flankers for the upcoming season of warm weather are launching in April 2015. Illustrations of new teh new editions are signed by artist Yulia Brodskaya. 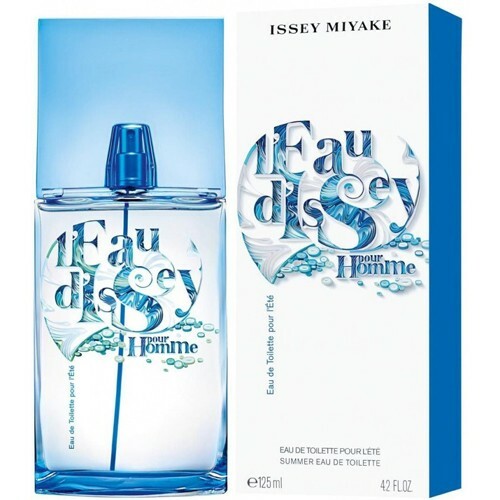 L`Eau d`Issey Pour Homme Summer 2015 (or L`Eau d`Issey Pour Homme Eau de Toilette pour l'Ete) is a fresh fruity - woody fragrance for men that offers a refreshing and exotic flavors of kiwi. It opens with a blend of kiwi, grapefruit and coriander. The heart is made of pineapple and nutmeg, laid on the base of vetiver and cypress. It is recommended for daytime wear.